Housed in a commanding steel-and-glass structure, the 4-star BEST WESTERN PREMIER Dua Sentral features free Wi-Fi, an infinity pool, and 5 dining options. Free shuttles go to KL Sentral, Suria KLCC and Bukit Bintang. BEST WESTERN PREMIER Dua Sentral is within a 10 minute drive of KL Sentral, Petronas Twin Towers and the Bukit Bintang shopping district. 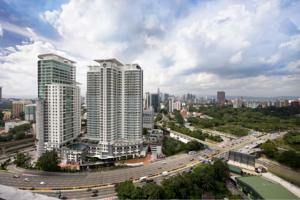 It is 1.5 miles from Mid Valley Megamall and 34 miles from Kuala Lumpur International Airport. Featuring modern interiors and bright fabrics, stylish rooms come with a flat-screen TV, DVD player and iPod dock. Other in-room comforts include a kitchenette and cozy sitting area. Guests can work out at the well-furnished fitness center, or use the facilities at the E-business Centre. Concierge and currency exchange services are also provided at the 24-hour front desk. Kembali Kitchen serves local and international dishes, while Mediterranean and Oriental fusion food are available at Hugo’s on 6. Other dining options include seafood at Grill 582 and refreshing drinks at Grand Trinidad Cigar Divan. Rooms: Hotel Rooms: 362, Hotel Chain: Best Western. Free! All children under 12 years stay free of charge when using existing beds. There is extra beds/baby beds in a room is 0 capacity for extra beds/cots in the room.